Fun fact: Humboldt State has an alma mater, and it was written in 1943 by an alumna named Joyce Bruner (‘45, Music Education). HSU’s “official” song, the alma mater is a piece of University music tradition that generations of students have heard, though probably without realizing what they were listening to in the first place. Alma maters are anthems for universities and high schools you’d hear at the end of college athletic competitions, according to HSU Music Professor Gil Cline. The Marching Lumberjacks advisor Scott Gerving says the band has performed the song for decades. Bruner’s place in HSU history would have been forgotten had it not been for her daughter, Sally Luotto, who set out to confirm something she had heard decades earlier: that her mother composed the University’s official song. “I’m proud of her connection to Humboldt history. There aren’t many people who can say their mother wrote a school’s alma mater,” says Luotto. Her quest began after an accidental discovery. “I read something that mentioned the composer of HSU’s alma mater was unknown, which I knew wasn’t true. That’s what started all of this,” she says. After doing some digging, she visited HSU’s News & Information office one day last November. She came bearing snapshots of a decades-old newspaper story about her mom and snippets from Humboldt State College yearbooks—proof Luotto hoped the University needed to help set the record straight. 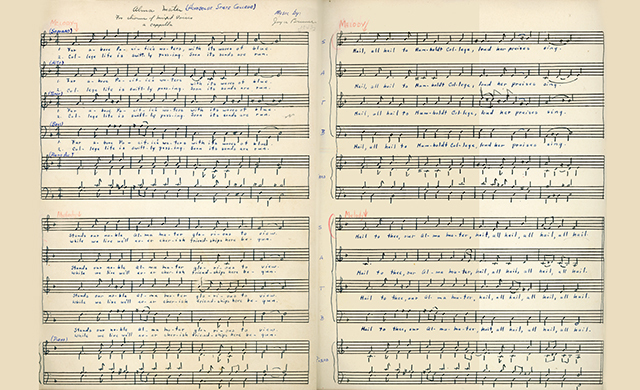 What Luotto didn’t know was that on the third floor of HSU Library’s Special Collections, hidden among the archives, sits the original sheet music of the song. When Luotto is given a copy, she’s stunned. She points to the longhand and Bruner’s signature written at the top of the page. “I see this and feel very close to her— her handwriting and style of music notation was so unique and familiar,” says Luotto. So who was Joyce Marian Bruner? She was raised in Ferndale and became an elementary school teacher. A product of the Depression era and World War II, she often buffed and waxed her linoleum kitchen floor to make it last. Music was a big part of her world. So was Humboldt State College, where she and her twin sister enrolled in 1941 and met two football players, their future husbands. “My mom loved her years at Humboldt State College. When those four got together, they always reminisced about Humboldt, how it formed them, and how much fun it was,” Luotto recalls. The story goes that Bruner, who was in a campus madrigal group, entered a contest to compose the alma mater and won. Luotto has more anecdotes from her own days as an HSU student in the late ‘60s-early ‘70s. There was the time her Music Professor Lee Barlow made a surprising announcement in class one day. “We’re standing on the risers when he says, ‘I want to introduce you to a new member. This is the daughter of the lady who wrote the alma mater,’” Luotto recalls. She received a similar introduction by Music Professor Charlie Fulkerson during his music appreciation class.